Phillies first-round pick Adam Haseley signed his first professional contract in the morning and took batting practice at Citizens Bank Park for the first time later on Wednesday afternoon. Ten days ago, Adam Haseley was a student-athlete at the University of Virginia sure that his next step would come in professional baseball but unsure when and where that journey would begin. A week and two days after the Phillies selected him with the eighth-overall pick in Major League Baseball’s draft, Haseley was in major league uniform at Citizens Bank Park for a day. 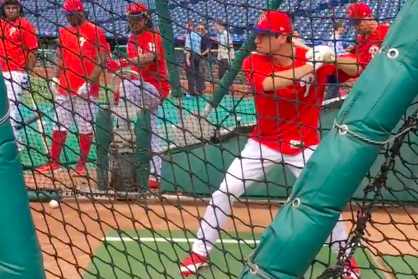 After finalizing his first professional contract in the morning, Haseley hit in a batting practice group with Maikel Franco, Howie Kendrick, Freddy Galvis, and Andrew Knapp in the afternoon. Haseley will talk to the media in a bit here in South Philly. Until then, feast your eyes on the entirety of his batting practice session. By the way, Haseley was just a Phillies for a day, of course (or for a pregame batting practice session, really). He is likely to begin his pro career within the next week at either Short-Season Williamsport or Class A Clearwater. Williamsport is probably more likely, although we argued over the weekend why Clearwater might make more sense.